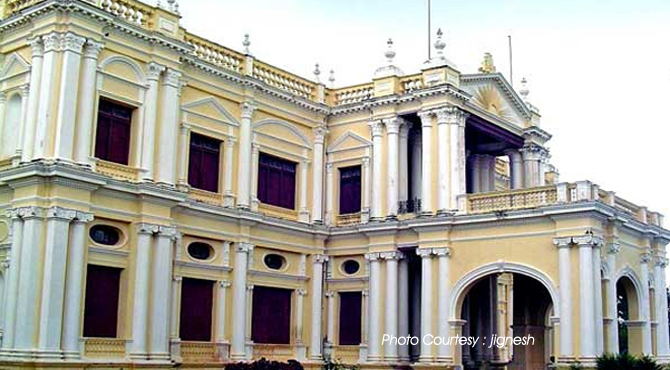 Jayalakshmi Vilas Mansion is a building in Mysore city, Karnataka. It is one of the most beautiful heritage buildings in Mysore. Rises on a hillock on the west side of Kukkarahalli Kere(lake), the mansion is bounded with beautiful lush green landscape of Manasagangothri, the campus of University of Mysore around 5 kilometers to the west of the city. It reflects the rich architectural splendor of the ancient times. Previously known as 'First Rajkumari Mansion', it was built in 1905 by the Krishnaraja Wodeyar IV for the, eldest daughter of Maharaja Chamaraja Wodeyar, Princess Jayalakshmi Ammani. The total building cost was 7 lakh rupees and in 2002 it was renovated at a cost of Rs. 1.17 crores. The mansion was again inaugurated in 2006 by the Karnataka Governor. The palace is great example of architectural marvels of those days. This structure is divided into three sections erected on strong columns but it is connected as to give the appearance of a single massive structure. The north and south portion of this structure is connected with a small over bridge and the interior have extensively rich carvings and mouldings of ancient Indian design. Other architectural features like the twin Corinthian and ionic columns, regal pediments, pilastered window-sets and oval ventilators adds to the grace and glory of this huge monument.